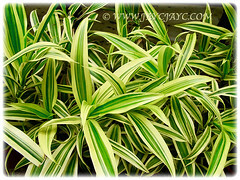 Dracaena reflexa ‘Song Of India’ is a beautiful variegated cultivar of Dracaena reflexa. It has become a very popular ornamental shrub in the home and landscape gardens. Plant the ‘Song of India’ to add beauty and interest to your garden. 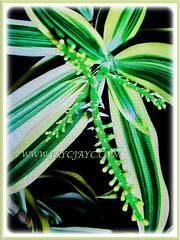 Botanical Name: Dracaena reflexa ‘Song of India’ (sym. : Pleomele reflexa). 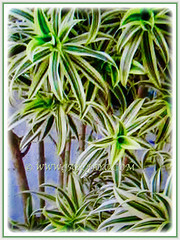 Common Names: Pleomele, Dracaena reflexa variegata, ‘Song-of-India’, Reflexed Dracaena. Etymology: The generic name, Dracaena is derived from the romanized form of the Ancient Greek drakaina, meaning female dragon. The specific epithet reflexa is from Late Latin word reflexus, meaning bending back. Origin: Native to Madagascar, Mauritius, and other islands in the Indian Ocean. It is grown in tropical and subtropical climates throughout the world. Plant type: An ornamental evergreen shrub or small tree. 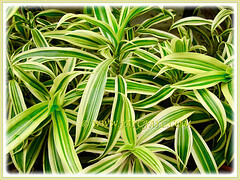 Features: Dracaena reflexa ‘Song of India’ is a species of the genus Dracaena that comprises of about 120 species of trees and succulent shrubs. A slow-growing shrub, the ‘Song of India’ is an upright, multi-stemmed, evergreen shrub or small tree reaching about 2.4 to 6 meter in height. It has a bushy tree type of look about them. Plants usually have numerous stems growing with an irregular habit becoming oval-shaped with an open crown. Stems are flexible and little-branched. When the lower leaves die over time, it will show the silvery brown stems covered with leaf base scares from fallen leaves. 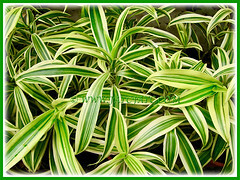 There are various cultivars of the Dracaena reflexa that display different leaf variations, although the most popularly grown is the yellow edged variegata type named ‘Song of India’. It has yellow stripes on the leaves with short, narrow and pointed leaves that are spirally arranged on the stem and tufted at the ends of branches. 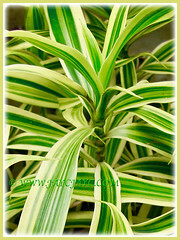 Indeed, a captivating ‘Song of India’ with beautiful and captivating variegated leaves. The glossy leaves are the main attraction. They grow up to about 30 cm long and 2.5 cm or so wide. This species can flower, though rarely and are not very attractive or noticeable. The blooms with clusters of near white small flowers are arranged on panicles. It does not set seeds as flowers are sterile. 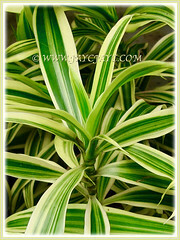 Culture (Care): Dracaena reflexa ‘Song Of India’ can be easily grown with minimum care. Light: Best in a bright indirect light location. Semi-shade spot is ideal too. Avoid direct sun that will scorch its foliage. Moisture: Medium water needs. Require high humidity levels to thrive. Do not overwater. Always allow the top soil to dry out before watering. Overwatering may cause root rot. Soil: Best in well-drained, humus-enriched and loamy soils. Others: This plant takes well to pruning and will frequently/easily sprout multiple new heads where it is cut back. Remove the lower leaves when they begin to yellow. Give it a shower to keep the foliage healthy and clean.Feed once monthly when it is actively growing with a basic houseplant food at 1/4 the recommended strength. Remove the insignificant flowers as they are unproductive and rob the plant of resources. It does well when kept root-bound in small pots. Use a humidifier to improve humidity or place the plant on a tray of pebbles sitting in water below pebble tops. Generally free from serious insect or disease problems. However, do watch out for mealybugs, spider mites and scale. The ideal temperature are between 15°C to 27°C. Allowing the temperature to go below 12°C can harm the plant. Avoid having the plant sitting near cold drafts. For non-hardy regions, grow it as a houseplant or in the greenhouse. 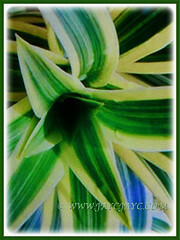 Dracaena reflexa ‘Song Of India’ flowers in spring and summer but rarely seen. Feed once monthly in spring and summer when it’s actively growing with a basic houseplant fertilizer at ¼ of the recommended strength. Propagation: Easily propagated with stem tip cuttings, about 7.6 to 12.7 cm long. Place the cuttings, usually more than one to ensure success, into a new pot with a moist potting mix. 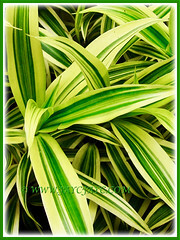 Usage: Dracaena reflexa ‘Song Of India’ will be an excellent specimen and accent in your garden. Ideal to be grown in garden border/bed and as a hedge. It can be ground grown or in large containers. Can be grown as an indoor plant. Their cut leaves and leafy twigs can be used in tropical flower arrangements. In the NASA’s clean air study, Dracaena reflexa was proven to remove a considerable amount of toxins from the environment. Thus, grow this ‘Song India’ not only to beautify your garden but to act as a purifier indoors and outdoors.